Vinicius became the most expensive teenage footballer ever last May when Real Madrid agreed to sign him for €45 million ($55.63 million). 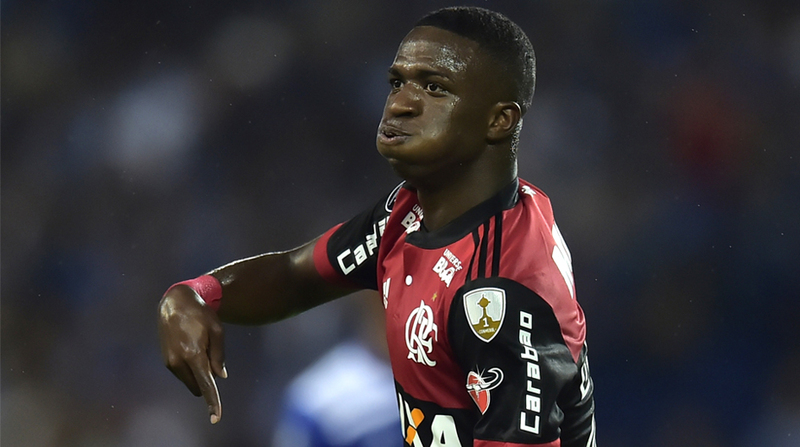 Real Madrid-bound teenager Vinicius Junior came off the bench to score two late goals as Brazil’s Flamengo defeated Ecuadorian side Emelec 2-1 in their Copa Libertadores group match here. Striker Brayan Angulo opened the scoring for the hosts on Wednesday when he ran onto a lofted Pedro Quinonez pass and unleashed a bouncing shot that eluded goalkeeper Diego Alves, reports Xinhua news agency. Vinicius, who replaced Everton Ribeiro just after the hour mark, equalized by dribbling past two defenders and rifling in from close range. The 17-year-old then sent a curling effort into the bottom corner after a one-two with midfielder Diego. “There have been a lot of people criticizing me but I’ve been working hard and with the help of my teammates I was able to be decisive in this match,” Vinicius told SporTV after the match. The move was originally slated to take place in July, but Flamengo are reportedly negotiating with the reigning Spanish champions to keep him for another year. The Brazil U17 forward is now Flamengo’s leading scorer this year with six goals in 11 matches across all competitions. Wednesday’s result left Flamengo leading Group D of South America’s top club competition with a win and a draw from their opening two matches. In Argentina, veteran striker Hugo Pavone netted two second half goals as Estudiantes beat Peru’s Real Garcilaso 3-0. Lucas Melano put the Argentine side ahead just after halftime with a shot from close range before Pavone converted a penalty after an Ivan Santillan handball. Pavone, 35, added another goal with a low strike following a Facundo Sanchez cross. In other matches on Wednesday, Colombia’s Atletico Nacional defeated Ecuador’s Delfin 4-0, Brazilian giants Corinthians beat Venezuela’s Deportivo Lara 2-0 and Bolivar were held to a 1-1 draw by Chilean side Colo-Colo in Bolivian capital La Paz. Real Madrid star keen to jump 'sinking' ship, open to Premier League move?